We all love free - right? 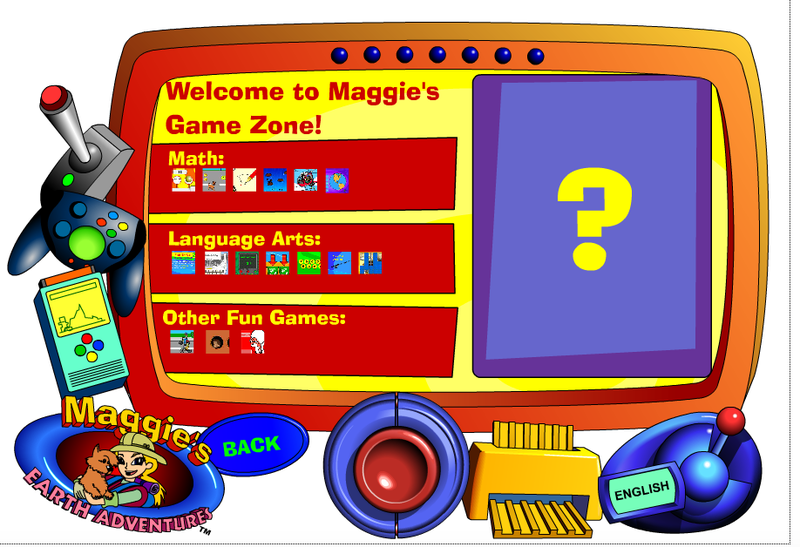 That's just what Maggie's Big Home and our companion program for elementary-age students offers you - free printable activities, weekly teaching suggestions, and even educational but fun on-line learning activities. 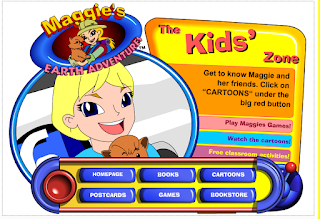 This week our sister program, Maggie's Earth Adventures found at www.missmaggie.org goes back to school with a printable activity designed to help teachers, students, and families become familiar with this exciting site. To help your preschoolers and kindergartners join in the fun, we are highlighting some of the interactive games that can help the younger set. After clicking on the big red button, just click on Games. Math games such Dude's Dilemma, Around the World in 80 Seconds, and Join the Dots are appropriate, engaging, and educational for many preschoolers. 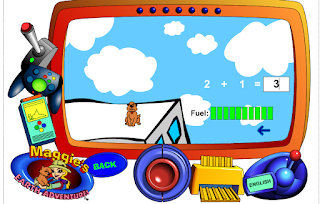 Here they can rescue the dog, Dude, from a rooftop by adding one digit numbers. It's also intriguing for children to "test their memories" by playing games like Mega Memory. 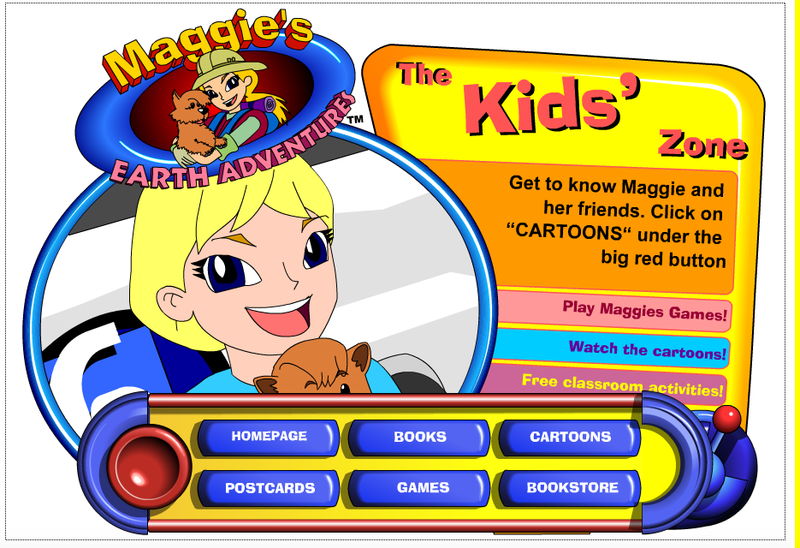 We hope you will try these out in your classrooms and encourage families to take a look at all www.missmaggie.org has to offer. And while you're at it, please sign up to receive our free activities for the younger set. The bonus? 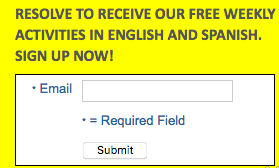 We offer them in Spanish, too, all for the low price of FREE! You will see this box right here on this page to the upper right. Your email address (we NEVER share these!) is all you need to provide to take advantage of these best practices offerings. 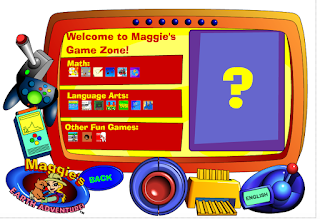 See you next week to officially begin Maggie's Earth Adventures 18th year of providing sound educational material to teachers, students, and families. School Routines and School Vocabulary: Think Explicitly! As we enter a new school year, it is helpful to remember that we often take our use of vocabulary for granted. We may not always realize that school words such as row or whisper may not have meanings for our children. This is why it is essential we use comprehensible input to be sure our children understand school vocabulary. Have children practice whispering before you ask them to whisper. Be sure children act out words like row or column before using these words in directions. While we know this is essential for our English Language Learners (ELLs), we can't assume English speakers have a context for these words. Remember, school is a new experience for our preschoolers! As we think about ELLs and children new to the school experience, we should consciously use motions, drama, and pictures to be sure all children understand what we say and the directions we give. Make a game of asking children to sit in a row. Have them practice what it means to listen carefully. Ask them to line up several times without leaving the classroom. Give a big round of applause when these school experiences are done to your satisfaction. Establishing routines like this, in an age-appropriate way, in the beginning of the school year will make the school experience more successful for everyone. It is also helpful to let families know what you are doing. Either send home a daily explanation (in the languages spoken by your families) detailing how you are establishing school routines or post a sign outside of your classroom. Ask families to support you by reviewing the new vocabulary at home or by explaining to parents how they listen during story time, etc. This helps the learning to go smoothly and it shows families you value their support. Children can decorate their spinners in any way that suits them. This is also a good opportunity to practice school-readiness skills and remind children to put their name or initials on their work. Give each child a paperclip to position on the spinner as shown in the photo. Next have children "launch" their spinners by holding them up high, paperclip down and watching them "twirl" to the ground. Encourage talk about what was observed. Then have children ask "what if" questions. For example, you might explore what would happen if more paperclips were used on each spinner. You could also launch spinners from various heights. How do spinners travel when you stand on a table? Does it spin differently when you are seated? You could make additional spinners of different types of paper. We encourage children to ask questions, make predictions, test their ideas, and then adjust thinking. As you know, this is good science, but it also sets the stage for helpful comprehension strategies when children begin reading. Remember that hands-on activities such as this are helpful in encouraging those in the "Silent Period" to begin trying new language skills with peers. This is one of the best ways to move children along the language learning continuum.